On Tisha B'Av this Sunday, a fast day mourning the destruction of the First and Second Temple, Jewish activists plan to protest against the discrimination against Jews on the Temple Mount and the impunity given to Arab terror-supporters on the holy site, in a call to build the Third Temple. The Temple Mount and Land of Israel Faithful Movement (also known as the Temple Faithful Movement) plans to march to the Temple Mount at 11 a.m. on Sunday, the Movement's head Gershon Salomon told Arutz Sheva on Thursday. 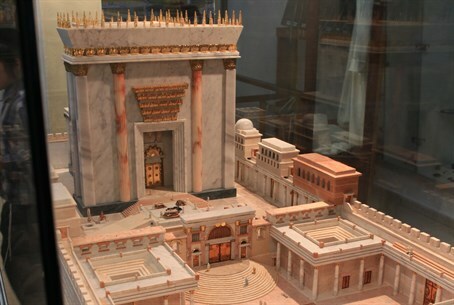 Salomon said the march is meant to mourn the "destruction of the Holy Third Temple by Israel's enemies" - in other words the prevention of the construction of the Third Temple, which is said to prelude the final redemption, due to the presence of hostile Muslim sources on the holy site. Likewise the protest is meant to mourn how Hamas and Islamic State (ISIS) are allowed to go around "carrying their flags" on the Mount, the holiest site in Judaism. During the event, Salomon intends to call on the Israeli government "to remove the enemies from the Holy Temple Mount, to return the Holy Temple Mount to Israel and to immediately rebuild the Holy Third Temple." The Jordanian Waqf retains de facto control of the Mount even since its liberation in the 1967 Six Day War, and it has forbidden Jews from praying at the site despite Israeli law ensuring freedom of worship. Arabs at the Temple Mount have repeatedly desecrated the holy site by among other things playing soccer games; in one warped case last December, police arrested a Jew who requested a soccer game be stopped at the site - despite the fact that in September 2013 promises were made to enforce the law passed by the High Court years ago banning the soccer games on the holy site. Likewise Arabs have tried to erase the Jewish nature of the site, where the First and Second Temples stood, by destroying ancient Jewish artifacts and building illegally.